Talks about the growing demand for infrastructure updates began well before the 2016 presidential election. While anyone who drives on our nation’s roads, bridges, and highways can see that there are obvious areas of opportunity—not everyone is taking the time to consider the big picture. For example, the nation’s lousy roadways cost the trucking industry well over $50 billion dollars in delay-related costs. Don’t think that affects us all? Think again. What Makes a Roadway Poor? 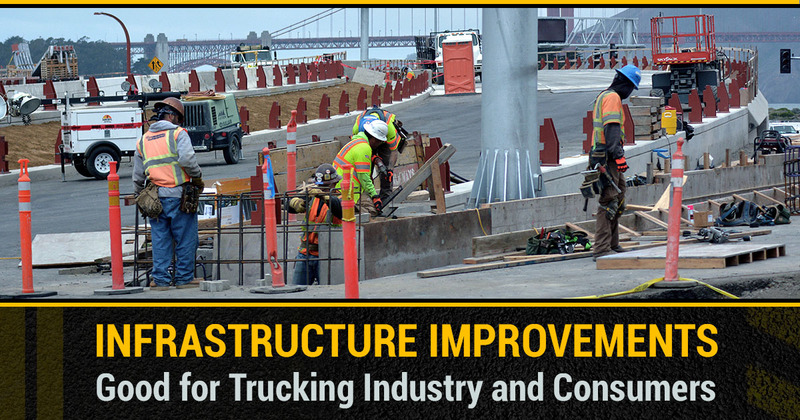 There are many factors that contribute to the quality of the highways and roadways we drive on. This could include local roadways that need more lanes, or need lights or roundabouts to help control traffic. Some of these could include highways that require better on and off ramps and lane management. This can also include any roadway or bridge that has damage or wear and tear that makes driving with comfort and ease a challenge. In other words, if the roads aren’t keeping up with population growth, or the volume of peak traffic times—there is always room to improve. It’s a number that is a bit difficult to fathom, but our failing nationwide infrastructure costs trucking companies at least $50 billion a year. While every trucker needs to consider their routes and plan accordingly, even with the most advanced routing software—it is impossible to accurately predict the inevitable bottlenecks and non-peak traffic delays. When you add up the cost of the 728 million hours spent in unscheduled traffic, the extra fuel costs of sitting idle, and the ramifications of late deliveries, this easily adds up to well over $50 billion in unexpected trucking costs each year. While some states, such as Texas, have tollways that you can choose to beat the congestion—the tolls add up. How Do These Costs Affect Us All? You might not consider what is inside the semis you see driving cross-country, or the large trucks you see around town—but they carry a wide range of products and supplies that we all use. Everything from clothing, to food, electronics, appliances, furniture, and anything imported, shipped, flown, or driven from out of the local area. Odds are, most products will ride aboard at least 3 different carriers before they make their way to you. So, when one carrier’s costs rise—someone must pay for it. While consumers don’t pay for it directly, they pay for it indirectly. Trucking companies increase their costs, so wholesalers and distributors increase their costs so that they don’t lose money. Since the wholesale price is higher, the ticketed price for the consumer rises. It’s a vicious cycle. However, this is all just the tip of the iceberg. Traffic delays increase everyone’s fuel costs while sitting idle, unkempt roads wreak havoc on tires and suspension, and increased time on the road increases nationwide pollution. At first glance, infrastructure might sound like a ‘nice to have’ but without improvements, the trickle down will continue to cost us all. Hunter Tires Sells Commercial Truck Tires and Bus Tires. Ask us about truck fleet tire discounts.